Examine the toolbar in the GeoGebra Classic applet window below. Notice anything that looks unusual? 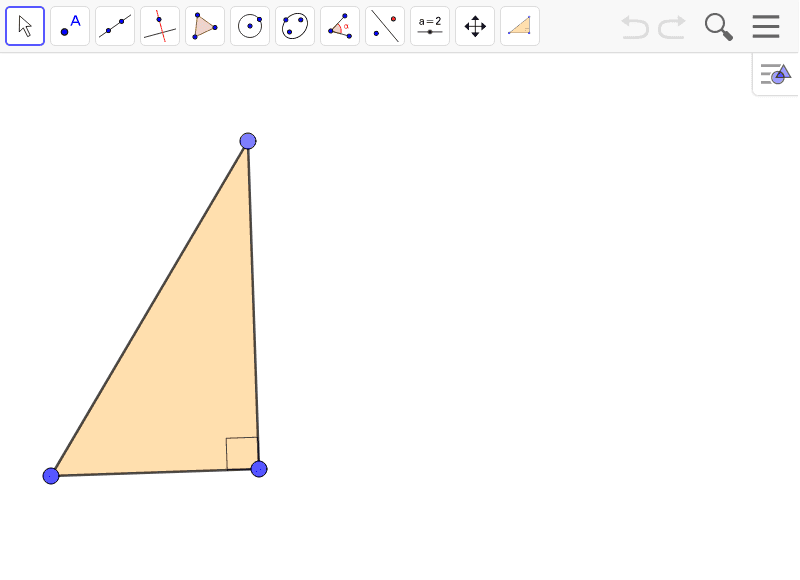 Interact with the RIGHT TRIANGLE (custom) TOOL (far right). All you need to do is select this tool & then plot 2 points. Having a quick tool like this can be time-saver for students. For example, in a unit where students are studying about right triangles, it is would be convenient to simply have a RIGHT TRIANGLE TOOL (like this) to quickly plot a right triangle. As a result, students can have more time to proceed with an investigation relating to right triangles. In the screencast below this applet, we'll learn how to create a custom tool (such as this one) in the GeoGebra Classic app ONLINE.